Das Tal—which is German for "The Valley"—describes itself on Kickstarter as "the world's first Open World Battle Arena." 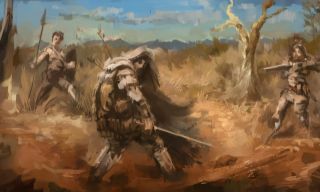 It's an MMO featuring semi-randomly generated worlds to explore, each with its own environments and rules, and players will take part in raids, sieges, and even diplomacy. But the focus is entirely on skill-based PvP action, with potentially serious consequences for coming out on the losing side. "PvE elements in the traditional sense, like dungeons and NPCs with advanced mechanics, will be virtually non-existent," David Wells, community director at developer Fairytale Distillery, recently explained. "What we will have are dynamic events, most involving spawned NPC's, that encourage players to converge on areas of the map and either work together or compete with each other for the prize. So while Das Tal lacks traditional PvE, we do try to create a diverse range of scenarios where players will interact with each other, rather than a deathmatch where players are purely trying to kill each other." Even more interesting is the studio's plan to address the need for end-game content by literally ending the game world. Das Tal worlds will be "time-boxed," meaning that they will run for a certain amount of time before events lead to an apocalyptic climax. "The focus of time-boxed worlds is to actually allow us a lot of flexibility in game design, and also to remove some issues that we personally see in the MMO genre. Restarting game worlds removes the issue of overpowered end-game players facing new players, and also allows us to avoid a stagnant end game," Wells explained. "The process itself will work by triggering an event when certain 'end conditions' are met. At this stage there are multiple conditions proposed internally. The event will cause an NPC army to spawn in the game world, and will also remove players' ability to respawn—meaning, ultimately, a last man standing battle. This is all in its planning stages however, and is subject to change." Wells acknowledged that there's some "uncertainty" among players over the prospect of regular world resets, but said that the game's lack of conventional MMO grind should clear up any potential backlash. "What we aim to do is not simply reset worlds, we also want to change the journey from A to B. We want people to be engaged in enjoyable gameplay on a daily basis, not doing daily quests and gathering from resource nodes for hours," he said. "At the end of an RTS match people don't think, 'Aww man, now that it's over I have to do all that early game again.' They think, 'That was an awesome match, I wonder what will be different in the next one. What tactics should I try this time?' This is the feeling we hope to give people as they move from one of our game worlds to another." Development of Das Tal actually began more than six years ago, according to the Kickstarter, and the "core team" has been working on it full time for the past two. The campaign, which runs until June 10, is seeking €50,000 ($57,000). More information about the game can be found at das-tal-game.com.